That’s not really a wallet, one might say. More like a cardholder, one might also say. I guess one could use it as a card holder. 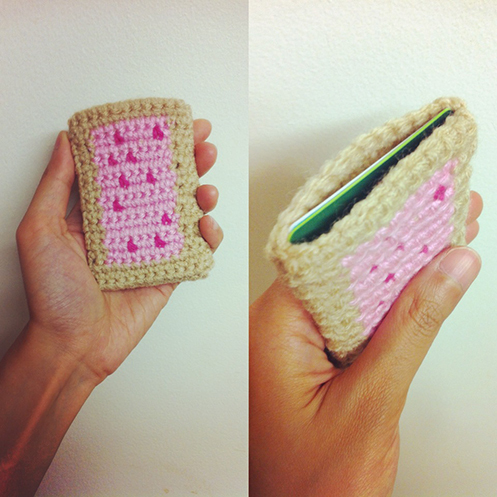 I made myself a tiny wallet this size when I started working at a coffee shop nearly a decade ago. There were no lockers in the backroom, so I made a wallet that would fit in my jeans pocket, so that it’s always on my person as I worked. I’ve been using the small wallet ever since. My bank cards and IDs fit snugly in it. And the few bills I have I’d just fold them up to fit them in. In case anyone finds a crocheted case of this size useful, I’ve made a chart! :D And a few notes describing how I made it. The finished size is about 2.5″ x 3.5″. 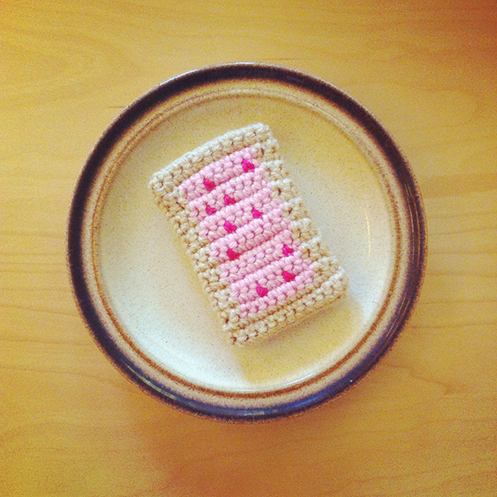 I used worsted weight yarn in tan, pink and dark pink, a 3mm hook, and a tapestry needle. At the end of the chart, you’d have 18 rows altogether. Don’t fasten off, crochet 18 more rows with tan. Fasten off, leaving a long tail for sewing. With wrong side out, fold the piece in half crosswise, sew the sides together. Weave in ends, turn right side out. 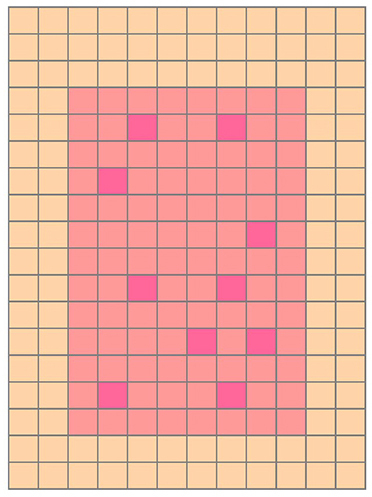 The first row incorporating pink (3rd row of chart) is wrong side, as are all the rows with just pink. All the rows incorporating both pink and dark pink are right side. Changing colours: in the stitch before new colour, yo and draw up a loop with old colour, yo with new colour and pull through loops on hook. Carry the strands of colours not in use as you crochet and wrap the strands in the stitches you make. When working on the right side, carry the strands of yarn on the back of the work. When working on the wrong side, carry the strands of yarn in the front of the work. Have a good rest of the week and weekend, everyone!